Taxi Castelli Romani is a group of taxi drivers operating in the Frascati and Grottaferrata area, that can be contacted on their 24 hour phone number 06 94.10.800 or by email info@taxicastelliromani.com for advance bookings. In Frascati you can find them at the taxi rank just at the side of Bar Brega in Piazza Roma (just off the square where you can see Villa Aldobrandini). They also have a website: ﻿www.taxicastelliromani.com﻿ . 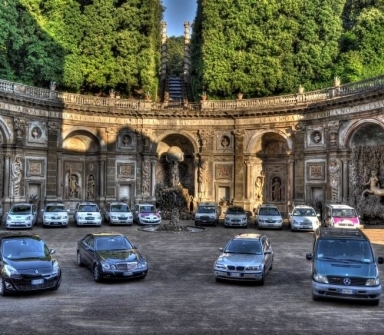 Vehicles are available up to 8 seaters (note larger vehicles cost more) and they can provide transfers to and from both airports, to the center of Rome and local trips. If you book your two way (inbound and outbound) transfers in advance you can save an extra 5 euros each way. Easyfrascati.com pass holders will be given 10% discount on whatever the meter reads, on any service, even local trips. Make sure you advise the driver and show them your pass! !